There's a new mailing list, centralOH@python.org, for Python users in and around Central Ohio. If this describes you, please join us! The Cleveland area already has a wonderful Python users' group - clepy. Those of us too far from Cleveland have been out of luck, though. We hope to use the new mailing list to gather together a bunch of Python users from the area, then begin to plan some live events. Eventually, perhaps we'll have a full-fledged, regularly meeting user group. First, though, we need to contact each other! So, please, if you know anybody within shouting distance of central Ohio, let them know about centralOH@python.org ! Pardon, your template is showing. Forgetting to apply data to your template is a pretty understandable mistake. 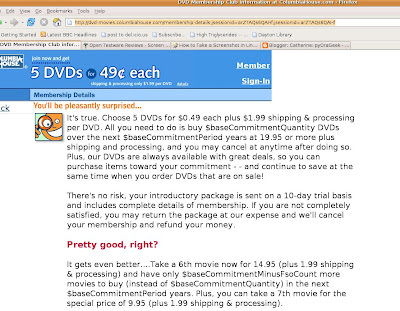 But why are quantities like $baseCommittmentNumber queried live, while "6th movie" and "7th movie" are hard-coded? I hope they weren't just too lazy to generate ordinal forms of $baseCommittmentNumber+1 and +2 on the fly! Incidentally, when all is said and done, the Columbia House deal works out to a minimum of ($0.50 X 5) + ($15 X 1) + ($20 X 3) + ($2 X 9) = $93.50 for 9 DVDs. Joe Wirtley (a CodeMash attendee) blogged an appeal for folks to include a photo of themselves on their blogs. I think it's a great idea - this weird bloggy world of electronic chatter is the most useful when we keep it linked to the world of flesh-and-blood. It's a shame to think that I've probably walked right past people at conferences whose writings I knew well. I'm thinking of taking the appeal a step further. I love being able to recognize people and call them by name. Unfortunately, I'm a nerd, and I'm not very good at it. I struggle to find techniques to empower my socially deficient brain. Often, after I get someone's business card, I rush away to jot notes on the back - notes about what they're involved in and what we talked about, but also notes on their appearance. This is a desperate attempt to enable myself to recognize them the next time we meet, probably months or years in the future. The trouble is, a few phrases like "tall; curly hair" or "beard, glasses" really aren't enough. I fantasized today about buying a cameraphone, snapping a photo of each person I meet, then finding a tag-based filing tool so that I could store the photos with the people's names and keywords about where I'm likely to see them again. Then, before arriving at an event, I could review the photos of people I'd be likely to see there; when I arrived, I'd call out to them by name and feel so cool. Now, just imagine if somebody gave me a business card with their picture on it. Wow! I'd be so grateful! It would short-circuit this entire dilemma! It's almost time for me to get new cards printed, and I could lead this incredibly useful trend by putting my own photo on them. Except... I'm nervous that it will come across funny, like I'm a wannabe model or something. Traditionally, geeks are supposed to imagine themselves as not really even having faces, as just being disembodied intelligences free-floating in the ether. The thing is, that's really not a useful myth. Talking to each other - face-to-face when we can - has very real value. Maybe I should go ahead and do it anyway, and not worry about what people think. Maybe just being "the weirdo who puts her picture on her business cards" isn't so bad - for networking purposes, being weird isn't as bad as being forgotten. It's not "goofiness", it's "branding", right? Hmm. Opinions? Would anybody join me on this? Wow, CodeMash was FUN! It was chock-full of the kind of inquisitive, energetic people who make you glad to be a geek, both in the formal sessions and the informal sociable stuff. It was nice to have Kevin's co-author Mark Ramm there, too. Questioning the authors beats leafing through a book any day... I just ordered my copy of the TG book for $26.99 from Nerdbooks. Amazon can slightly beat that price ($25.64), but at Nerdbooks I could toss in mildly outdated books on Unix and DB2 for $2-3 each. David Stanek's talk on "Python Web Services" was actually more important, I thought, for the language-independent description of the relative merits of REST, XML-RPC, and SOAP-based services than it was for the Python-specific content. If you were off at some .NET talk instead, and you've always been a little fuzzy about how those work and relate to one another, go read his slide deck. As a data geek, I really perked up at Scott Guthrie's keynote on LINQ. It's a new language component that basically extends the SQL idea (describe what data you want, let the computer worry about how to get it) beyond just RDBMS and into flat files, XML, web services... wherever the data may be squirreled away, it'll be a way to go get it with a single consistent syntax. Cool! I'll be eagerly looking forward to IronPython implementations of LINQ. So, Microsoft - thank you for LINQ, thank you for being one of the CodeMash sponsors, and I forgive you for Vista overwriting the GRUB boot loader on my dual-boot machine this morning (but only because I found a tutorial on how to repair it). James Ward demonstrated ooooh-aaaah stuff you can do with Flex, which wasn't surprising. More importantly, I learned that the Flex/Flash world has really opened up ("opened" as in "open source"). When I looked into it a few years ago, it seemed that you needed a $mucho-K Flash server to even dip in. That's not the way I do things; I build a minor app or two - something that will really be used, not a development-only toy - before I know whether I really want to run with a technology. Now, most of the stack is open-source and free; only a couple optional (admittedly very convenient) components are commercially licensed. Adobe's new mostly-open-source business model for Flex permits my kind of experimentation; good for them! Kevin Dahlhausen's talk on Test-Driven Development filled an embarrassing gap in my understanding of TDD - I'd heard of mock objects, but had never really figured out what role they play in TDD. I took part in two Open Space discussions - one on women in IT, one on social networking for nerds - that were important enough that I think I'll give them their own blog posts in the next few days. I heard Martin Fowler's name come up so many times that I finally screamed (internally), "Okay OKAY I'll read his stuff, already"! In a week or so, I'll update this post to include hotlinks to the talk slide decks; most of them aren't posted yet. Anyway... so much glorious fun. With CodeMash in January and PyCon in February, who dares call winter a blah time? I'm here at CodeMash in Sandusky! I'd thought about blogging the whole conference real-time, but I think I'll only be doing a little of that... my laptop is fearfully heavy, and dragging it around all day would seriously inhibit my enjoyment of the Hallway Track (the stuff you learn chatting informally with people between sessions). Anyway, so far, CodeMash is AWESOME. Very professionally run, and with excellent content. It began last night with a great expert panel discussion on languages - the sort of experts who seem to know a dozen different languages in more depth than you know your very favorite. It feels so good to have something like this here in Ohio. As a Pythonista, I was very gratified that the whole panel had a lot of knowledge of and respect for Python; it seemed to be mentioned more than any other single language! Tha panel took up the question of "which language should new computer science students learn?" The consensus was that sticking to any one language is a real mistake. Every language carries its own limitations and patterns of thought; learning new languages broadens the ways you have to think about a problem. Teaching students only one language risks hard-coding the assumptions and limitations of that language right into their brains. The rule of thumb "learn a new language every year" came up. As for specific languages, Python was the first reccommended... and assembly ended up also very highly reccommended. Anyway, it's going to be a great conference. I'll try to update tonight. There will be a lot of tough decisions about which talks to go to, and I may decide against some of the Python talks - partly because I might be already beyond some of them in skill, and partially to honor the cross-language spirit of CodeMash. I'll be at PyCon, Feb. 23-25 in Dallas! I'll also be at CodeMash in Sandusky! I've mentioned both these conferences, but this is a good time to remind you of both of them, because the early-bird PyCon registration is almost upon us (Jan. 15) and CodeMash itself is almost upon us. After two conferences in two months, my employer will probably manacle me to the server for the rest of the year, but it'll be worth it. I'd been coy up until now as to whether I'd actually make it to these events; my personal schedule has been wildly chaotic. But now I've got reservations in hand, so I'll see you there! Re-introducing the Geek Event Aggregator - the world's most comprehensive and least accurate compilation of technology events! The Aggregator regularly scans a huge variety of event announcement websites and gathers the information into a single location. Now, when the VIC-20 Users' Group schedules a meeting down the street from your in-laws in Pittsburgh, you'll know it. The Aggregator uploads its data into a Google Calendar account - the most convenient way to access it is as a Google Calendar user (which I really do recommend.) Here's what you do. 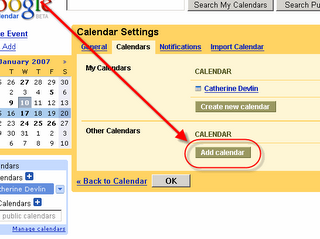 Log into your Google Calendar account and choose "Manage Calendars". 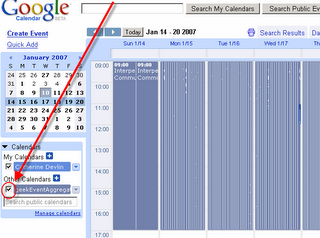 Search for "geek event aggregator", then select "Add Calendar". Return to your calendar home. Oops, your calendar now looks dense with events. That's because you're seeing an unfiltered list of all events, everywhere. Better un-check "geekEventAggregator". Now you can make real use of the Aggregator - search for the city, state, or region of interest. 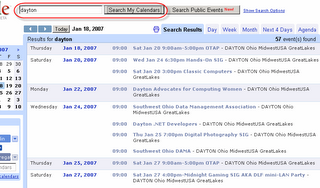 The Aggregator attaches several keywords to each event based on its location. Don't take anything the Aggregator reports at face value! Double-check it all. Remember, it's just a poor computer trying to read webpages that were written for humans. It doesn't even attempt to find the time of day, it just declares that everything runs 9-5 Eastern time (who cares if it's in Johannesburg?) I expect to keep gradually improving the accuracy as time goes by. If you don't have and don't want a Google Calendar account, you can also access it through a static HTML page, an ICS document, or an XML feed. In that case, you don't get Google's handy Search button, and you'll need to use your own patience/creativity to find events in the places you want.